By fifth grade, students demonstrate knowledge of the solar system by naming the planets that revolve around the sun. To make a model of the solar system, they use different-size round objects for the planets and they create a ring for Saturn and multiple moons as well. Fifth-graders can create a stationary model of the solar system to concentrate on the differences between planets and their respective places in the system, or they can ask classmates to help demonstrate how the planets revolve around the sun. Select nine foam balls to represent the sun and eight planets (10 if you're including Pluto). The proportionate sizes of these balls will not be correct because Jupiter and Saturn are so large. If you represent Mercury with a 5-centimeter ball, for example, Jupiter would be 142 centimeters or nearly 5 feet in diameter. Choose the largest ball possible for the sun. 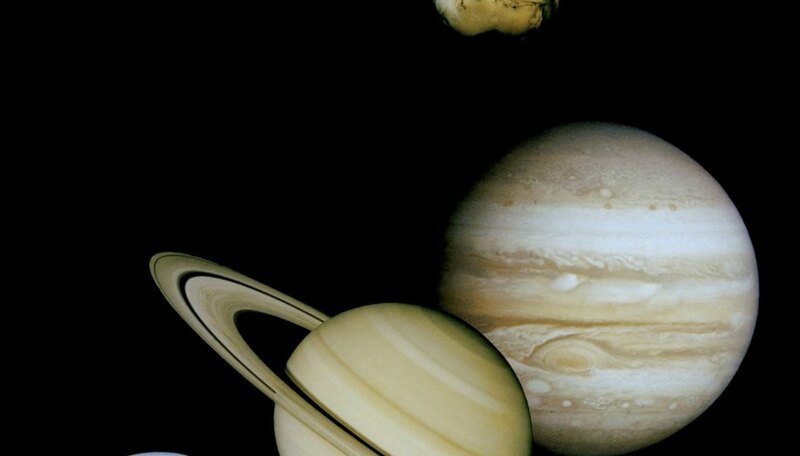 The planets from biggest to smallest are: Jupiter, Saturn, Uranus, Neptune, Earth, Venus, Mars and Mercury. 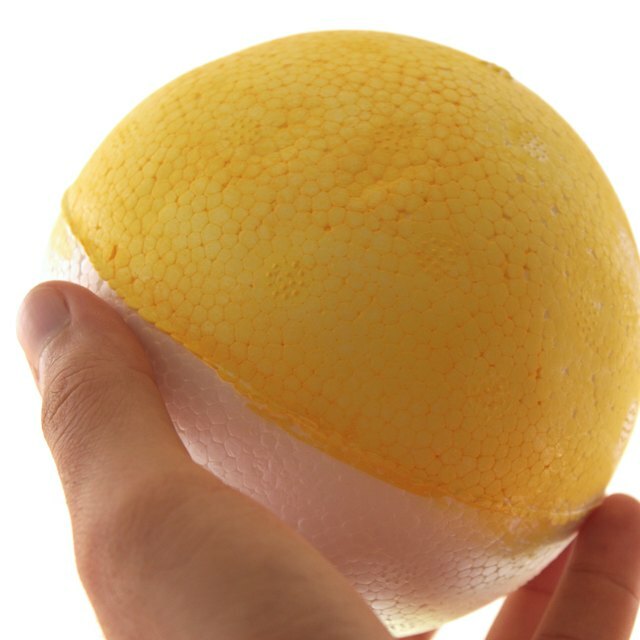 Add Pluto as the smallest orb if your school's curriculum still identifies it as a planet. Color or paint the balls to demonstrate the different colors of the planets. Paint the sun yellow, Mercury dark yellow, Venus splotchy gray, Earth swirly blue and white, Mars pale red, Jupiter striped orange, Saturn striped yellow and purple, Uranus pale blue, Neptune blue and Pluto gray. Cut a ring out of a piece of poster board, paint it the same color as Saturn, and attach it to Saturn's middle with glue. Push chopsticks into the 9-by-2-foot foam board, 1 foot apart. Add an extra foot of foam board if you choose to include Pluto. Push the sun and then the planets onto the tops of the chopsticks in this order: Sun, Mercury, Venus, Earth, Mars, Jupiter, Saturn, Uranus, Neptune, Pluto. Paint the foam board black and cover it with silver glitter to represent stars. Place beads on the foam board around each planet to represent their moons. Alternatively, secure each bead to one end of a pipe cleaner and push the pipe cleaner into the planet to demonstrate how it orbits. Earth has one moon, Mars two, Jupiter 63, Saturn 61, Uranus 27, Neptune 13 and Pluto 3. Note that scientists discover new moons every year. Ask classmates to hold the planets and demonstrate how they revolve. The students with Mercury, Venus, Earth and Mars will be close to the sun and running quickly. The student with Jupiter will run slowly around the inner four. The student with Saturn will run at half the pace of Jupiter. Uranus and Neptune will walk far around the inner six. Pluto will walk very slowly on the perimeter. Create a model that shows proportionate size by cutting planets out of large pieces of art paper and posting them on hallway walls or drawing outlines of them on the floor with colored tape. Murphy, Cara. "How to Make a Model of the Solar System for the Fifth Grade." Sciencing, https://sciencing.com/make-model-solar-system-fifth-grade-10012232.html. 24 April 2017.